Donald Trump tweeted Tuesday that he would allow South Korea and Japan to buy a “substantially increased amount of highly sophisticated military equipment.” Though the White House has not explained why, presumably the president hopes such transfers will help deter North Korea, which set off its sixth nuclear bomb over the weekend. Tokyo is planning a major missile-defense upgrade: its 2018 budget proposal requests funds for Standard Missile-3 Block 2A interceptors, PAC-3 MSE interceptors, upgrades to air and missile defense radar — and most significantly, Aegis Ashore, the land-based version of the the air-defense combat system used on many American, Japanese and South Korean warships. (It would be just the second deployment of Aegis Ashore, after one in Romania.) Roman Schweizer, an analyst with Cowen Washington Research Group, adds that Tokyo is also considering buying THAAD interceptors. Both Japan and South Korea already have Patriot air-defense missiles. On Monday, Trump also “gave his in-principle approval to South Korea’s initiative to lift restrictions on their missile payload capabilities.” A 2012 deal between the U.S. and South Korea had limited the latter’s missiles to 800 kilometers and warheads of 500 kilograms. 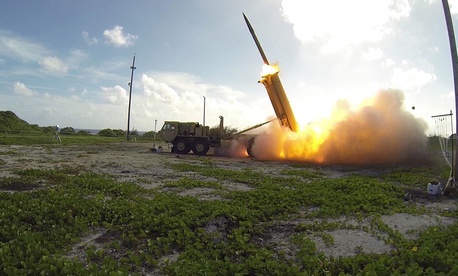 Seoul will now be able to launch warheads of 1,000 kilograms, improving its ability to destroy hardened targets, said Bruce Klingner, a former CIA deputy division chief for Korea who is now a senior research fellow for Northeast Asia at the Heritage Foundation. The U.S. could likely transfer more powerful bombs and missiles to South Korea from its own stockpiles rather quickly. But remember: the U.S. military had already been raiding its global missile stockpiles for the three-year-old airstrike campaign against ISIS in Iraq and Syria. It’s been working to replenish its inventory. Both South Korea and Japan are already buying the fifth-generation F-35 Joint Strike Fighter. South Korea plans to buy 40 F-35s, with the first arriving next year. Japan is already starting to build its own 42 planned F-35s. The two nations are also buying the Global Hawk high-altitude surveillance drone. Another possible option could be the General Atomics Avenger drone, which can fly higher and faster than propeller-powered drones and can carry 3,000 pounds of sensors or bombs. Last month David Alexander, who leads General Atomics’ Aircraft Systems division, touted the plane’s “long endurance and persistent time on station to stare on something,” as particularly useful over North Korea. The most drastic possible solution for up-arming South Korea would be the deployment of new tactical nuclear weapons. These are lower-yield nukes that could be launched via rocket systems like the MGR-3 Little John artillery system. The U.S. removed all of its nuclear weapons from the Korean peninsula in the 1990s. Over the weekend, South Korean Defense Minister Song Young-moo told a parliamentary hearing that he had a discussion with United States Defense Secretary James Mattis on the subject. “I told him that it would be good for strategic assets to be sent regularly to the Korean Peninsula and that some South Korean lawmakers and media are strongly pushing for tactical nuclear weapons [to be redeployed],” he said according to the Washington Post. The move would be a provocative one, likely inflaming tensions with China and Russia in addition to antagonizing North Korea. Candidate Trump was open to the idea of allowing South Korea (and Japan) to arm themselves with nuclear weapons. And while President Trump is fond of reminding people that “all options are on the table” his view of tactical nuclear weapons as an item on the table are less well known. On Sunday, Trump spoke with President Moon Jae-In over the phone to discuss “strengthening joint military capabilities,” according to an official readout. The capabilities the two leaders discussed include South Korean conventional missiles but not tactical nuclear weapons, a Trump Administration official said.